As time goes on, it becomes increasingly evident that the rules which the mathematician finds interesting are the same as those which Nature has chosen. "Proceedings of the Royal Society of Edinburgh (1939), 59 122. In A. Pais, 'Playing With Equations, the Dirac Way'. Behram N. Kursunoglu (Ed.) and Eugene Paul Wigner (Ed. 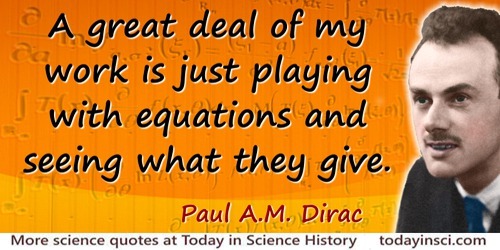 ), Paul Adrien Maurice Dirac: Reminiscences about a Great Physicist (1990), 109-110. 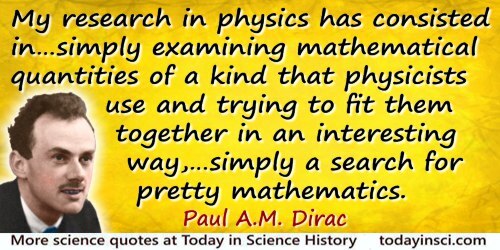 This quote is also on this web page in a longer version that begins, “Pure mathematics and physics are… ”. Quoted in Behram Kursunoglu and Eugene Paul Wigner, Paul Adrien Maurice Dirac (1990), Preface, xv. The Principles of Quantum Mechanics (1930, 1981), Preface, viii. The mathematician plays a game in which he himself invents the rules while the physicist plays a game in which the rules are provided by nature, but as time goes on it becomes increasingly evident that the rules which the mathematician finds interesting are the same as those which nature has chosen. In Ian Stewart, Why Beauty is Truth (2007), 279. 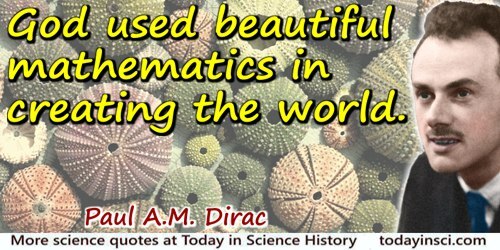 The research worker, in his efforts to express the fundamental laws of Nature in mathematical form, should strive mainly for mathematical beauty. He should take simplicity into consideration in a subordinate way to beauty It often happens that the requirements of simplicity and beauty are the same, but where they clash, the latter must take precedence. From Proceedings of the Royal Society of Edinburgh (1939), 59 122. In A. Pais, 'Playing With Equations, the Dirac Way'. Behram N. Kursunoglu (Ed.) and Eugene Paul Wigner (Ed. ), Paul Adrien Maurice Dirac: Reminiscences about a Great Physicist (1990), 110.